This year, one of the photos in the yearbook at Hector Garcia Middle School is not like the other. Pictured alongside the portraits of smiling students is one particularly friendly face — Taxi Benke, a service dog who looks out for 14-year-old Rachel Benke. Rachel and Taxi have been inseparable for the last four years, ever since they were connected by Cindy Buechner, who trains seizure alert dogs. When Taxi first came into Buechner's life, she immediately thought of Rachel's mom Teresa who she'd met at a jewelry party, and knew the dog would be immensely helpful for the family. "They found us," Teresa told TODAY.com. "We hadn't been looking into service dogs...we thought she might need one when she was older, but it was just a God thing that he found us." Rachel was born with an inexplicable abnormality to the right side of her brain, and has experienced epileptic seizures since birth. The older she got, the worse the seizures were, and there were times she'd have as many as 200 seizures in a day. She ate mostly baby food for the first six years of her life, and was completely non-verbal. When she was 6 years old, Rachel had two corrective brain surgeries, and the results were unbelievable. "It was just miraculous," Teresa said. "She starting eating, started talking, started learning. We were told she would probably never be able to read, and now she's reading Dr. Seuss books by herself, and some chapter books." The seizures were reduced drastically, but she still suffers from them occasionally, and that's where Taxi comes in. He attends class every day with Rachel in San Antonio, Texas, and is connected to her via a buddy leash. "They're so cute together," Teresa said. "They're such a great team." Taxi can alert family and teachers when Rachel is about to experience a seizure. "He predicts she's going to have a seizure up to an hour and half before it happens," Teresa explains. "It seems to be a smell that the body emits, but until dogs can talk we can never know for sure." Once, when Rachel was swimming in the family's pool, Taxi suddenly bolted up and began slapping at the water. Rachel's parents took her out of the water, and 10 minutes later she had a seizure. On another day, when Rachel was going to play on the trampoline in the backyard, Taxi put his paws on her shoulders to stop her because he felt a seizure coming. Sure enough, one occurred a few minutes later. And as always, he was right by her side. "He always stays on her left side because she falls on her left," Teresa explained. Rachel's seizures can become very severe, but no matter what she does, Taxi always orients himself so that he's in the right place: "He breaks her fall." The trusty companion has also become a beloved part of Rachel's school. "Last year I joked, 'Where's Taxi's picture?'" Teresa said, of Rachel's 6th grade yearbook. "He's here every day, he deserves to be in the yearbook, too." So when picture day rolled around this year, she asked if the photographer wouldn't mind snapping a few of Taxi. 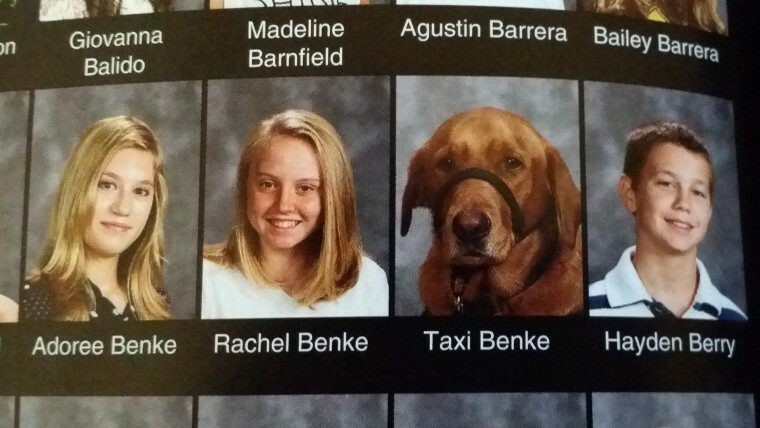 And when this year's yearbook came out, the family was thrilled to see their precious pup proudly displayed next to the young girl he takes care of. The gesture meant a lot to the Benke family, but they didn't expect it to garner so much attention — the side-by-side shot of Rachel and her dog on the yearbook pages quickly spread across the Internet. "When I posted that picture, never in a million years would I have imagined that it would rise to this magnitude," Teresa says. "It's been fun, and it's been even more fun watching [Rachel] get excited about it. Three years ago this wouldn't have even registered for her."